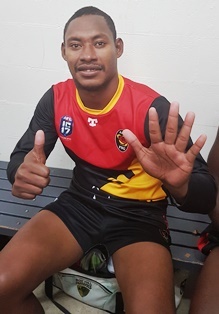 Amua Pirika's (pictured left) six goals for PNG against the USA on Saturday was not enough to give him the lead in the Men's Division 1 leading goalkicker*. Despite a total of 10 goals from his past two games he still trails Great Britain's Andrew Walkden by two. Walkden sits on twelve goals after kicking six of his own on Saturday against Ireland to add to five against South Africa in Round 1 and one against Canada in Round 2. In Division 2 Croatia's Ivan Ivos leads the goal kicking with eight for the tournament. In the Women's Division there is a five way tie for the top position with Christine McCutcheon from Ireland, Danni Saulter from GB, Jessica Estrada from USA, as well as Sally Fong and Verenaisi Caginavanua (both from Fiji) all on 6 goals so far. *These statistics are based on those supplied by the AFL International Cup website.